that I knew right there that this product would make me feel better the coming days, and it did! My swollen hemorrhoid shrunk quickly after three days. It was a quite a relief since it was no fun moving around or sitting with pain in the buttocks area. I’ve tried using topical cream for hemorrhoid before but Tucks medicated hemorrhoid pads are so much better in treating the condition fast. helps a lot lessen the burning sensation I was feeling. I change the medicated pad every time I use the bathroom. I just toss the old ones into the toilet and flush them afterwards. It is septic friendly which is also an added benefit. to run out of it. For $6 a tub containing 100 wet pads, it’s all worth it. Once in a while my hemorrhoid came back due to weight gain and straining. But I have the solution right in my bathroom. Two applications are enough to find relief. I truly love this product. I highly recommend this to others who suffer from hemorrhoid. It is affordable and it works! I say these do what they say gives you temporary comfort, coolness and relief, and makes you a lot more comfortable, than you were before you got them, they are well worth the money, A good brand. Glad they sell them. I have tried them in the past but if it is not to bad you can take a bottle and some vinger with some soap a bottle with a top that shoots water hot are cold if it doesn’t hurt shoot water on the promble it will help with pH too. 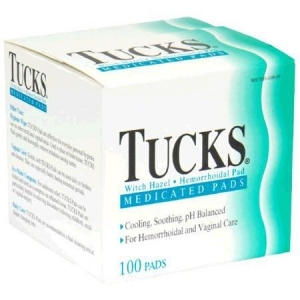 I used these tuck pads with my first child had to be cut a little more than usual to get her out and these pads worked well during my healing process. Great product.